Do you know a young person who has done something to make us all proud? Be it an academic or sporting achievement, an act of kindness or courage, then nominate them for a Pride of Somerset Youth Award. 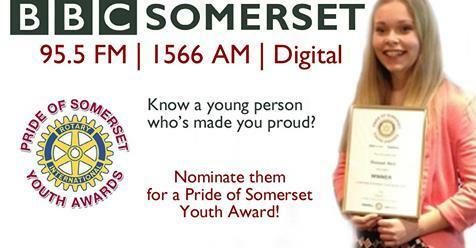 Do you know a young person under 20 who lives in Somerset and you are particular proud of what they have achieved? They may have excelled in Sport, Music, the Arts or Academically; helped raise money for charity, caring for others, spent time volunteering and made a particular impact in their community. They may have overcome an adversity either physical or personal or they may have undertaken a one-off act of heroism. Whatever exceptional thing they have done, if you think they deserve recognition then make that nomination today. If you are proud of what they have done then all of Somerset will be proud. The deadline for nominations is Friday 12th April. The Awards evening will be held at Bridgwater and Taunton College, Taunton on Friday May10th when BBC Somerset's Breakfast presenter, Claire Carter and the Mid- Morning presenter Simon Parkin will be hosting the Awards ceremony. The Awards are organised by BC Somerset, The Rotary Club of Taunton, Bridgwater and Taunton College and the Somerset County Gazette series of newspapers. President Tom Stobie, hosted a magnificent Burns Night celebration for the Rotary Club of Taunton. 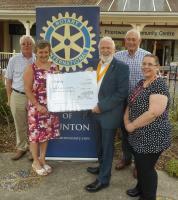 Motivated by local media reports of young lives being lost to drugs, members of Taunton Rotary have acted quickly to support the North Taunton Partnership ' Drug Bus' initiative aimed at educating young people on the impact of drug abuse. A Great Success - Featuring the Taunton Military Wives, this year's 100 years anniversary choral concert was a great success, raising over £3,500 and held as a tribute to all those who served in the Great War 1914-1918.